"Games are difficult to design"
"Games mean spending money on expensive apps"
"Games are a waste of time"
What do brand owners want? They want to sell more product. They want a product that generates 'buzz' because word of mouth referrals are the most effective form of advertising. They want a product that humans love! And this is where 'games' step in. Games are designed with a primary purpose to be entertaining, fun and engrossing for humans. They may serve other purposes (like education, storytelling, brain training or issue awareness) but ultimately, people play them because they are fun. Fun is a powerful driver. Whether it's Candy Crush, Call of Duty or Chess, many of us take time away from our work and families to have 'fun.' In Las Vegas, 'fun' is a $240 billion industry. 13 million people have played "America's Army," a first person shooter designed for the US Army as an incredibly successful recruitment device. Smart marketers understand that fun is a serious business. 'Fun' simply means creating something that humans really, really love. And the funny thing is, we’re productive when we’re having fun. In 2013, out of desperation, I started selling on eBay and Amazon to make money. Instead of seeing sourcing as a stressful chore, I framed it as a ‘Treasure Hunt’ and recorded videos and posts to share my journey and discoveries as I ran from yard sale to book sale to retail store, hunting for profitable ‘treasure’ - and it worked! In that first year, I sold over $100,000 of product and founded a community that would go on to boast 17,000 'Treasure Hunters!'. Yu Kai Chou, a leading gamification expert argues that gamification should really be called 'Human focused design.' He suggests we design most things to be purely functional, as though they were to be used by robots or computers. Take for example, a treadmill. Walking on a treadmill serves a purpose - to improve fitness. It works, but it's boring and most of us don't really enjoy doing it. Along came the game, Zombies, Run! - an app that delivers a story and challenges through your earbuds. When you hear the zombies, you need to speed up and get your heart racing. Game mechanics can be integrated into simple products to make them more fun or we can reframe whole tasks as games. Take for example this lady who created a Battleships game to teach her daughter the periodic table. What other tasks can be simply gamified? Weight Watchers for example gamifies eating with points and rewards. Advent calendars gamify Christmas! When you think about it, even eBay is a gamified version of shopping with bidding, sniping, winning and feedback scores. Could you gamify cleaning the house or babysitting or even sleeping? 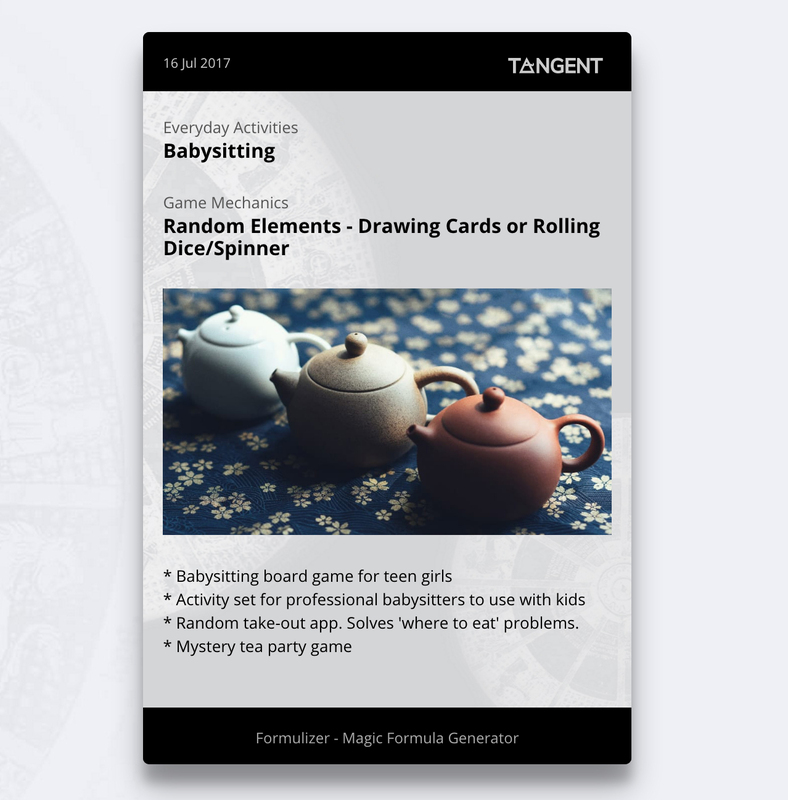 The Formulizer in Tangent actually includes an option to help you create games around everyday tasks or life events. The really exciting thing is that we have so many ways to deliver games. Zombies, Run! uses audio cues, but you could easily send instructions, clues or game pieces via email, Facebook, Instagram, YouTube video or even in physical form in subscription boxes or on cards or dice. You could also have an app built for your product to send notifications or track rewards. You can even take your game into the real world. Delta Airlines wanted to reach the "hearts and minds of New Yorkers" and be their 'go-to airline' so they created a real life treasure hunt in New York City, where participants had to find six 'Red coat' flight attendants. By the end of the contest, they had reached over 70 million people on Twitter and generated over 180,000 direct interactions, boosting the positive sentiment towards their brand. And this is a huge reason why gamification is successful in the social media age. They want to share pictures and engage one another in friendly competition, all building blocks of a viral hit on Instagram or Facebook. The subscription box, Barkbox gamified doggy pictures by creating a 'Destroyer's Club' complete with leaderboard, where proud dog owners can share pictures of their pets… well… destroying stuff! While Starbucks' #GiveGood promotion saw people posting pictures of pretty colorable cups they had decorated. Simple contests can drive stacks of engagement and if you can encourage people to invest a little time and work in supporting your brand 'for fun' like coloring a picture or brainstorming a new name you can really start to win their hearts and minds, just like Delta did. If people are doing something fun or novel, they want to talk about it with their friends. Gamification is growing and shows no signs of stopping. Many fitbit-toting Gen-Xers were raised on video games, while millenials are turning to HQ, the new game show app where over a million players tune in to live quizzes weekly. So how do you jump in on this trend? There are actually hundreds of game mechanics to choose from. Yu-Kai Chou's Octalysis model distinguishes 'black hat' and 'white hat' games. White hat games promote teamwork, creativity, socializing, achievement and learning, but lack urgency, while 'black hat' games promote urgency but rely on deadlines, fear and scarcity. Both serve a purpose. Yu-Kai claims that 'Epic Meaning' or 'Saving the World' is a key driver for people playing games, and companies like Toms Shoes who send a pair of shoes to a third world country for each pair you buy are tapping that 'epic meaning' by helping you to help save the world. Is there more your brand can do to give customers a sense that they are doing something more meaningful than just buying your product? White hat methods tend to make your brand more popular and likeable. Conversely, black hat methods are addictive but mostly meaningless. Are you playing the Vons/Safeway Monopoly game at the moment? It's addictive because each time you go shopping, you receive a game ticket that may contain a mystery prize (like a pack of gravy or a few dollars off chicken or rarely a million dollars!) Skinner's Box was a classic scientific experiment that found lab mice would press a lever repeatedly when they received a variable reward - such as different sized chunks of cheese. They didn't press so enthusiastically when the cheese chunks were uniform. Humans aren't very different! We wouldn't put money in a slot machine if it always returned our money and we probably wouldn't open the tickets if we knew for sure they always contained a gravy packet. The 'fun' is the variable reward. Fortune cookies, prizes in cereal packets and 'mystery' toys like L.O.L. Surprise! trigger that same sense of curiosity and momentary excitement. When there is an element of challenge, they become even more addictive. Have you ever spent more money trying to win a prize from a claw machine than it would have cost in the store? It's difficult to walk away from a challenge… especially when you start trying to recoup sunk costs of money and time invested. And of course… encourage your audience to buy more from you, more often!